A great idea to get your child used to the transition out of diapers is to create their own “My Potty Book” that takes them through the toilet training process. When your child is potty training, you’ll try anything and everything to help them learn the routine. One great idea to get your child used to the transition out of diapers is to create his or her own “My Potty Book” that takes them through the toilet training process step by step. It helps them celebrate accomplishments – and a way to have fun with your toddler! You can make one by cutting pictures out of magazines, using clip art on the computer, photos or even drawing by hand. Buy a special blank book at the store, use a small spiral artist's notebook with thicker pages, or laminate individual sheets and add them to a binder. Be creative! It doesn’t have to be professional; the key is to help your child begin to understand what’s expected as she trains and learns how to control her little body. The book is sure to become a favorite that you’ll read while your child is on and off the potty. Throw it in your bag when you travel or go somewhere unfamiliar. Your child will find comfort in the routine of reading it when on a strange new potty. To create your own “My Potty Book,” make your child the star of the story by using his name for the main character. Use details from your child’s life including favorite colors, toys, and friends or family as other character’s names. Sometimes, I dance around and my tummy feels funny; that’s when I remember I need to use the potty. I pull down my pants and sit on the potty. Sometimes, pee comes out. Sometimes, poop comes out. I feel so much better after I have gone potty! Ahhh. When I sit on the potty, I can sing songs, look at a book or hold my favorite toy. After I’m done, I use the toilet paper to wipe, wipe, wipe. I put the toilet paper in the toilet and flush. It’s so loud! I put on my training pants and pants. I always wash my hands with soap after using the potty. Now I can go play again! Sometimes I use the potty before I get in the bathtub or go to bed. Sometimes I use the potty just to see what will happen. I feel proud and happy that I used the potty! I feel like a big boy/girl when I use the potty! Be sure to make the successful ending a big celebration. You can even have a collection of stickers or stars your child can add to the last page every time she succeeds. This will surely make the book his own and encourage a sense of empowerment and pride in becoming a big boy or girl. 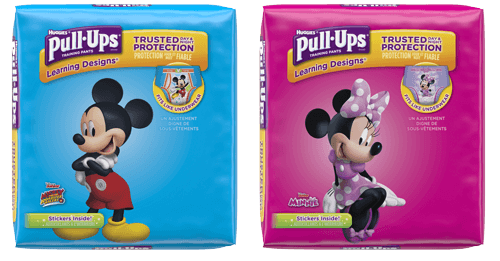 To find out more about potty training techniques check out Pull-Ups® Potty Partnership.